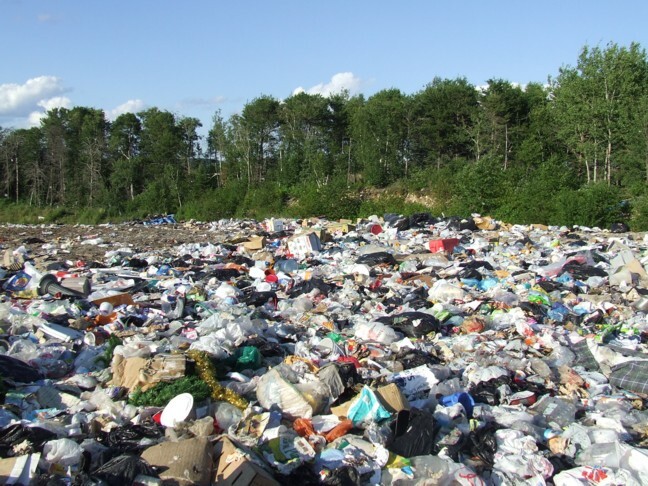 With calendars officially turning over to spring, that means everyone can start spring cleaning! collected a particle of dust! It's not so much the concept of cleaning that I'm against, it's what goes hand in hand with it, sweeping. Sweeping is extraordinarily inefficient. I'm pretty sure it's the only activity in the world where achieving three percent of the goal is an unmatched triumph. Keep in mind, if we translated that three percent to a standard elementary school grade scale, it'd be far below the tortoise level. Far below. Yet people trumpet up sweeping as some great end all, be all of cleaning prowess. But at no point in life has anyone sat back and said “You know what, I really like sweeping. The way I wave that wand and just watch the pile of stuff build up, it's truly magnificent. I just really, I just really like it.” The closet thing anyone has ever come to that is “Sweeping!?!?!?!?!? (really horrendous profanity that is unfit to print on such a nice, kind family oriented blog). No matter how many times you run the broom across a surface, you're not going to get all of the debris swept up. The design of a broom lets little bits of annoying through it. If you try going back and doing a second pass, it will still miss parts. A seventeenth pass? Sure, you might have created Carpal Tunnel's syndrome, but that doesn't sweep get any more fragments of vintage Urkel-O's cereal into the garbage, where it belongs. 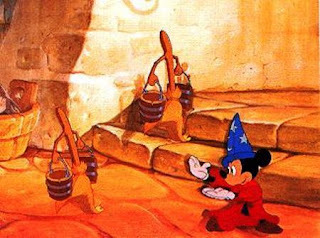 Fantasia--the only time brooms have done anything worthwhile. ... they did kill Mickey, right? There's got to be a better way. If you really think about it, the broom probably hasn't changed much since its invention some time during the middle ages. Sure, these days it probably doesn't cause massive amounts of plague and dysentery, but we can thank modern medicine for that advantage—the broom had little to do with it. But improving this torture device can't be something as simple as a vacuum, because those have already been invented, so inventing that wouldn't net me any lush royalties, and that's really the reason I'm into this whole improve the mousetrap sort of endeavor. Why don't we have like laser guided brooms now, ones that zero in on and destroy debris in a totally bitching fashion. That concept alone is making me antsy to get sweeping, but then I realize I have modern day brooms with their modern day shortcomings. The shortcoming mainly being lack of laser. I realize much of our lasers are probably devoted to trivial tasks like curing vision ailments or providing special effects in sci-fi films, so scientists probably wouldn't let that tech out, no matter how awesome it looks. 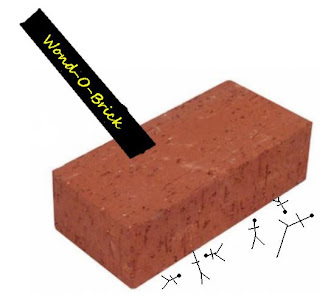 As for that whole lush royalties argument I mentioned earlier, don't worry, I'll still get justly compensated, because I have come up with such an amazing name for it “Wond-o-Brick.®.” Sre, it might not actually work any better, but it will definitely “sweep up” millions of dollars into my pocketbook. And that's the type of sweeping I can support.